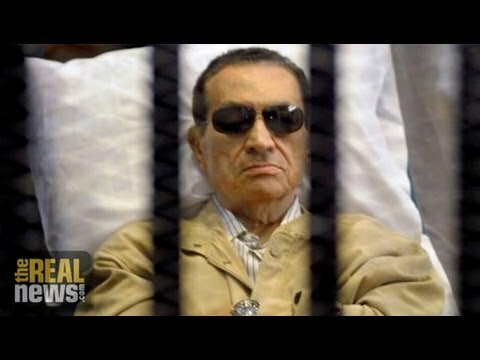 As violence continues in Egypt, reports have emerged that ousted president Hosni Mubarak may soon be released from prison. He was overthrown in 2011 after decades in power and, according to his lawyers, has been cleared of corruption charges and may be released within the next 48 hours. Meanwhile, the death toll is approaching 1,000 from the past several days of violence. Hundreds were killed over the weekend, including dozens of detained supporters of the Muslim Brotherhood. Dozens of police and security officials have also been killed, but the vast majority of those who have been killed over the past week have been supporters of ousted president Mohamed Morsi. On Monday, Human Rights Watch described recent events as the, quote, worst unlawful mass killings in Egypt’s modern history. Over the weekend, the Armed Forces chief, General Abdel Fattah el-Sisi, gave a nationally televised speech saying the army and the police are the guardians of the will of the people. Now joining us to discuss the latest news out of Egypt is Noha Radwan. She’s an associate professor of Arabic and comparative literature at the University of California, Davis. Radwan was born in Egypt, was among the participants in the 18-day Tahrir protest. She’s joining us now from Berkeley. NOHA RADWAN, PROF. ARABIC AND COMPARATIVE LIT., UC DAVIS: Thank you for having me. NOOR: So, as someone that was involved in the protests that ousted longtime Egyptian dictator Hosni Mubarak from power, what are your thoughts? What’s your response to the news that he could be released within the next 48 hours? RADWAN: I’m very upset over that, but I’m not all surprised. Over the last couple of years, since the ousting of President Mubarak, his trials have slowly and gradually cleared him of all the serious charges against him. All charges of corruption were not pinned on him and his cronies because rather than violating laws, they tailor-made laws that allowed them to take advantage of all the country’s resources and manipulate them and carry out all the corruptive measures above the law. Then there was the charge of shooting and killing the demonstrators in the protests against him in January-February 2011, and again the police failed to provide enough evidence to pin the charges on him. So one could see this release coming. It’s frustrating, it’s infuriating, but it’s not at this point surprising. This also leads us to the current crisis. I mean, whatever crimes President Mubarak committed in shooting the demonstrators, one can see that more violence on the Egyptian streets is still going on. Therefore there has–nothing has been changed. It is the same police force that we have had shooting the demonstrators in 2011 that is shooting the protesters on the streets of Egypt right now. NOOR: And I wanted to ask you about this news that 25 off-duty Egyptian police officers were killed by suspected militants in northern Sinai. Some have speculated that this was in response to what happened a day earlier, where 36 detainees, supporters of the Muslim Brotherhood, were killed in clashes with security forces. RADWAN: [incompr.] action, but certainly Egyptians woke up this morning to the two pieces of terrible news, one, that pro-Morsi supporters who were in the custody of the Egyptian police were killed, and that 25 police officers have been shot dead. These two pieces of news are very disturbing and testify to the ongoing violence. One cannot pin the shooting of the officers or the police people on the pro-Morsi supporters at this point, but it’s pretty clear that the Egyptian police is responsible for the death of those who were in its custody. It is a shame that even the reports about how these people died are conflicting. Some say it was because of gunshots. Some say they were suffocated because of excessive use of tear gas. It’s very disturbing and very infuriating indeed. NOOR: And let’s talk about the international–the ongoing international response to the ongoing violence mostly perpetrated by the Egyptian military. The European Union has warned Egypt that it will urgently review its aid to Egypt, and reports indicate that the Egyptian government has dismissed that threat, essentially. RADWAN: Yeah, the European Union made some strong statements. England this morning said it’s going to suspend all connections with the Egyptian military. These are good reactions. I’m a bit amused, actually, looking at the quandary that the United States has. As you probably know, the Constitution prevents sending aid to a country that has had a coup, and that’s why the United States has been at a loss what to call the military takeover on July 3. It is interesting to watch the ongoing debate. On the one hand, if the United States suspends military aid to Egypt at this point, as President Obama said, it will lose its leverage, its very weak leverage on the Egyptian military at the moment. Unfortunately, this will also increase the popularity of the generals of the Egyptian army. It’s a difficult situation because of the immorality of the use of military aid for leverage against another country in the first place, so that if the United States suspends its aid to Egypt right now, many people who have been calling for the suspension of the U.S. military aid to Egypt anyway will find this to be a good decision. I for one have been calling for the suspension of the U.S. military aid to Egypt since 2012, in fact, when the Supreme Council of Armed Forces was in charge and we were on the streets in Oakland as part of the Occupy Oakland, and Occupy Oakland was very supportive of the struggle of the Egyptian people at the time. And I said that the U.S. should suspend its military aid to Egypt and to Israel at that point and in fact use that money to support public education in the United States. So as you can see, it’s a difficult decision. The moral thing to do, the only responsible thing to do for the United States right now is to cut off the military aid. Unfortunately, rather than curbing the Egyptian military, it may actually increase its popularity on the Egyptian street. I would not be surprised that if the Egyptian generals suspect that the United States is serious about suspending military aid, that they would preempt this move by actually refusing it themselves. And this would increase the popularity of General el-Sisi to put him on the same level as former president Nasser as someone who stood up to the Americans and asserted Egyptians’ independence and, you know, separated them from being the client state of the United States that Egypt has been during Mubarak’s rule. NOOR: And, you know, it’s not like the Egyptian military needs the fighter jets to put down the protest. They’re using live ammunition and tear gas to attack the protesters, which appears to be the main deployment recently. RADWAN: You know, the funny thing is most of the U.S. military aid to Egypt goes towards purchasing of American-made tanks. And I have read somewhere that Egypt has many more tanks than it needs. So it is pretty clear that the U.S. military aid does not only benefit the Egyptian military; it also benefits the American administration and the American military complex in many ways. We know that American fighter planes can fly over Egypt as part of that agreement that keeps the aid flowing. We also know that American vessels have a priority in crossing the Suez Canal, and we know the American administration has not made a secret of this, that this has been extremely helpful in its own war against Iraq and Afghanistan. So you see it’s a very complex situation. It’s immoral on all sides. And it’s about time that maybe one good thing can come out of this terrible situation in Egypt, and that is the end of the military aid from the United States to the Egyptian military. NOOR: And finally, Noha, you were a part of the protest that deposed Mubarak back more than two years ago. Where are the revolutionaries today, and what are they calling for? RADWAN: Well, the revolutionaries are divided. It is very unfortunate, but some of them who would have found it inconceivable a year or two ago have now sided with the military and the police. The speech by General el-Sisi that you just quoted in the introduction to this interview, where he says that the army and the police are the guardians of the Egyptian public will, that’s a very sad statement. The army and the police are never guardians of the will of the population, and especially not so the Egyptian police. The Egyptian police is a massive apparatus that is very abusive and has a long history of abuse of power and of the population. We cannot forget that they were the main reasons why the Egyptian revolution started in the first place. It started as an uprising against police brutalities, police brutalities that have never ceased to happen, not after 2011 and not today. Actually, there is an interesting situation I wanted to bring to your attention before we end this interview. A lot of the revolutionaries were very upset at President Morsi, infuriated, in fact, and rightfully so, because during his presidency, the police brutality has continued. One of the young men who were shot during the presidency of President Morsi was a young journalist, and the Egyptian police refused to acknowledge, you know, the excessive use of force then. And then there was another case of another young man, Mohammed el-Gindy, who was arrested, abused in custody, and killed in custody, and then his body was released to the morgue. It was difficult to find it. And then the police never actually admitted what they did to Mohammed el-Gindy. Here’s the quandary that the Egyptian government finds itself in. It is the same minister of interior who was responsible for the torture and death of Mohammed el-Gindy who is now carrying out the assaults against the protesters, the pro-Morsi protesters. So how can we prosecute the Egyptian minister of interior when he is now the guardian of the public will of the Egyptians? Unfortunately, Egyptians must learn that the military and the police are not their friends. There are a few of the revolutionaries who know this and are fighting against the military takeover of the country, but many of them have switched sides and now see that the military is in fact their guardian and protector against the abuses of the Muslim Brotherhood. NOOR: Noha Radwan, thank you so much for joining us. And we’ll certainly continue to keep following developments in Egypt.